In the evening of Wednesday, March 27, 2019 and timed to coincide with BMW’s partner Art Basel’s show in Hong Kong, BMW and Artsy reline their long-term partnership: a new city guide feature within the Artsy app. The feature will be unveiled to users at an event co-hosted by BMW and Artsy and allows them to explore major museum exhibitions, art fairs, and gallery shows in six art-world centers across three continents, including New York, London, Hong Kong, Paris, Los Angeles, and Berlin. The app update will be available for iOS users from Wednesday, March 27, 2019. Further building on Artsy’s personalized, comprehensive, and intuitive art buying experience, the new city guide feature will create a seamless discover-to-collect experience for Artsy buyers. 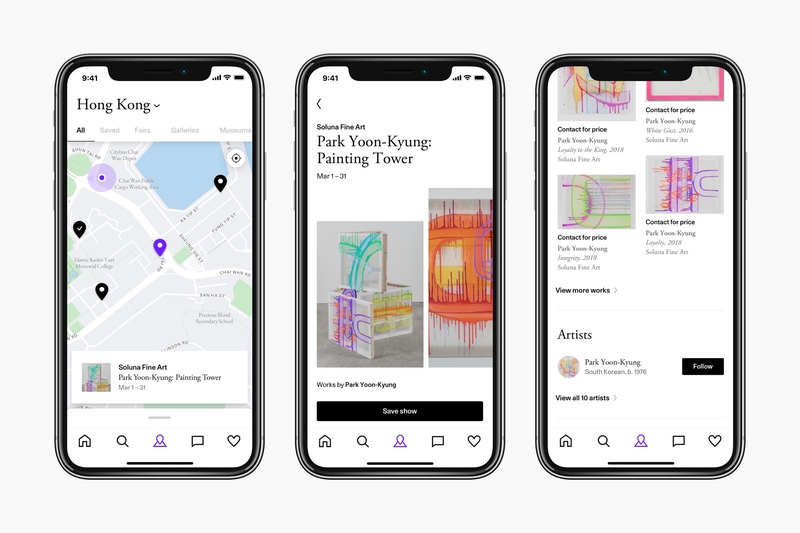 Users of the feature will be able to navigate around any one of the six featured cities with in-app GPS, discover current exhibitions and fairs taking place in the vicinity, browse works and artists showcased, and buy from galleries and fairs directly, all within the Artsy app. Because Artsy has the world’s largest partner network – 3,000+ galleries, 800+ museums, and 80+ art fairs across over 90 countries – the city guide will provide the most extensive opportunities for art discovery available. Additionally, users who have interacted with Artsy before will see a tailored selection of artists and artworks based on their preferences. They will also be able to save their favorites and explore the shows either virtually or in-person, as well as take advantage of the augmented reality feature to virtually place artworks from the exhibition or fair on their wall. Thanks to BMW, the new feature will also include selected private collections located all over the world and accessible to the public, all taken from the BMW Art Guide, whose fifth edition was just launched and is a one of a kind guide. Furthermore, the user will have the chance to find respective fair activations by BMW worldwide, from displays of vehicles of the BMW Art Car Collection to other numerous initiatives from the longstanding cultural engagement of the brand will be part of the feature. With BMW at the forefront of technological innovation and digital leadership when it comes to its core business, Artsy is a natural partner in the cultural realm. For the past fifty years, BMW has been involved in hundreds of cultural initiatives worldwide. Both Artsy and BMW are putting their heads, know-how and network together to create meaningful platforms for contemporary art in the future. The partnership of BMW and Artsy also includes an ongoing film series called the Future of Art, which profiles artists and creative luminaries such as Trevor Paglen, Carrie Mae Weems, and Elizabeth Diller.